Help me reach my Walk Against Hunger fundraising goal! What an exciting opportunity for us to work together to provide nutritious food to people in need. Join us at Lighthouse Point Park to rally in support of the Connecticut Food Bank and its network of local food assistance programs to make a difference in the lives of neighbors in our community facing hunger. Please consider walking with me or supporting my team. With your help we will be able to make a difference in our local community and in the fight to alleviate hunger. I hope you will encourage your family, friends and coworkers to get involved too! More than 400,000 people in Connecticut struggle with hunger. One in six Connecticut children is food insecure. It's a problem affecting not only our cities, but suburbs and rural communities across the state. This spring, the Walk Against Hunger will bring attention to their challenges and raise funds to put more food on their plates. More than 650 community based food assistance programs depend on the Connecticut Food Bank as a lifeline to nutritious food. Through this network, the Connecticut Food Bank distributes enough food in the six Connecticut counties they serve to prepare more than 57,000 meals per day. 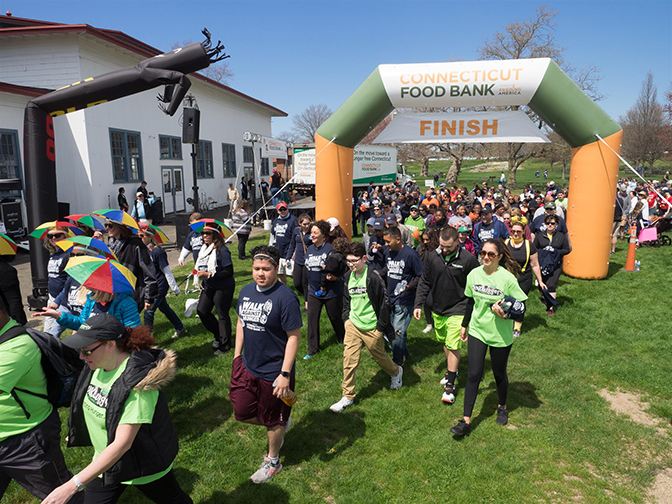 Walk Against Hunger proceeds expand the capacity of the Connecticut Food Bank to provide nutritious food to people in need. Your support helps the Connecticut Food Bank to supply shelters, soup kitchens and other hunger relief services that provide food to neighbors in your local community and raise community awareness about the problem of hunger and the need to help people right here in Connecticut.